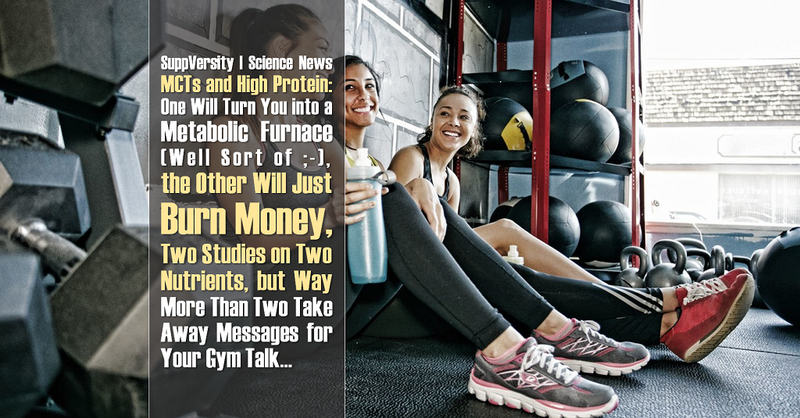 It’s about time for some nutrition science news. For today’s installment of the #ShortNews, I’ve picked two hitherto unpublished studies the main results of which have been presented recently as part of the Proceedings of the Nutrition Society Summer Meeting. The studies by Carr et al. and Maher et al. deal with the metabolic effects of two dietary nutrients you’ll all be familiar with: protein and medium-chain triglycerides aka MCTs. Acutely Increased Hormones Don’t Grow Muscle? With both of them being conducted in healthy, normal-weight individuals and the use of sophisticated measuring equipment (eg. metabolic chamber in Carr et al.) and/or additional ‘cardio’ exercise, respectively, both small-scale studies are – in my humble opinion – worth looking at, even in their current pre-publication stage. Hunger â, satiety â, and 24h energy expenditure â by 4.5% after high protein feeding (Carr 2018) – As a SuppVersity reader the sentence “[d]iets that are high in protein have the ability to keep an individual feeling fuller for longer and therefore have the possibility of reducing food intake” will be one you’ve read in this or a slightly modified version before. And yes, there’s plenty of evidence to show that the manipulation of dietary protein intakes can help people shed weight, avoid weight gain, and significantly improve glucose management and body composition. Studies like the one at hand, i.e. randomized controlled trials in which the authors actually measure the effects of a high vs. normal protein diet on whole body energy expenditure, hunger, and satiety in a cohort of healthy, normal weight participants for more than just the post-prandial phase (here 36h) are yet pretty rare. “The VAS measurements demonstrated that on average hunger was significantly less during the HP visit compared to the EB visit and satiety was significantly greater during the HP visit compared to the EB visit (P < 0.0001). Figure 1 presents results from VAS for satiety across the two interventions. Total EE for the HP visits were significantly higher compared to the EB visits (6.07 Â± 3.58 kJ/min vs 5.81 Â± 3.42 kJ/min, P < 0.0001)” (Carr 2018 | my emphasis). With the increased satiety and the concomitant +4.5% relative increase in energy expenditure the scientists measured in response to the HP diet, Carr et al. are right to point out that “[their] study […] may have implications for future weight loss strategies” (Carr 2018). You shouldn’t make the mistake to believe that the latter, i.e. the small thermogenic effect that amounts to 89.48kcal/day, alone, was enough to sustain long-term weight loss. What happens to a wanna-be or actual athlete like yourself, if you consume plenty of MCTs as part of your habitual diet? Will that shut down your appetite and turn you into a fat burning machine, as some MCT vendors promise? Well, we do know from previous research that medium chain triglycerides (MCT) increase energy expenditure (Ogawa 2007; Clegg 2013), and increase satiety and suppress food intake (Kinella 1985; Rolls 1988; Van Wymelbeke 1998). Coconut oil contains max. 50% MCT: Coconut oil is not a good source of MCT. As discussed at length in my recent “coconut oil for health”-review coconut oil contains “only” 45-53% MCTs. It is thus not surprising that studies such as Kinsella et al. 2017 show consistently that the physiological effects of pure medium-chain triglycerides and coconut oil differ. Figure 2: Exercise doesn’t “just make you hungry” as some people who also claim that insulin was the sole reason we’re fat want you to believe – check out the data from Schubert’s 2013 meta-analysis. The effects of exercise on appetite regulation are equivocal, though. The only thing we can tell for sure is that acute exercise does lead to energy deficits (Schubert 2013) – this means, energy compensations take time and usually won’t occur after a single bout of physical activity. 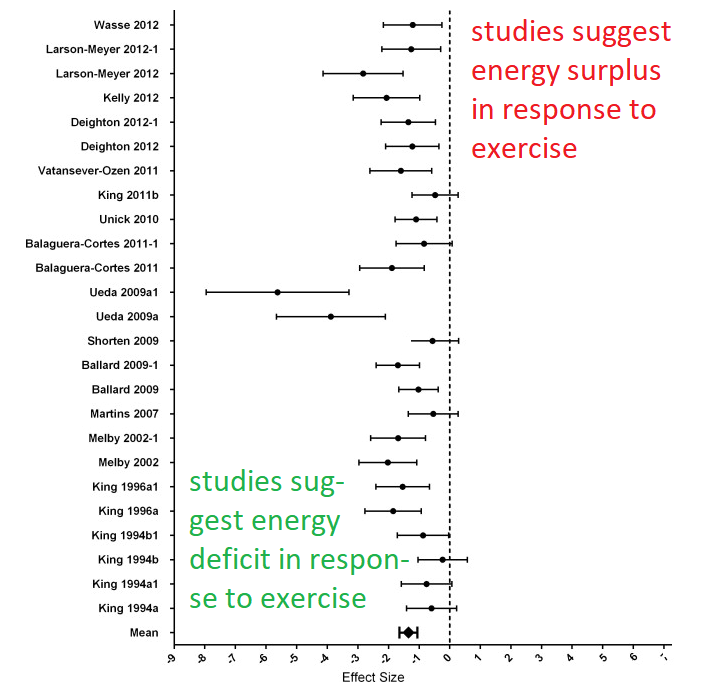 If you review the most important results of Schubert’s 2013 meta-analysis (see Figure 2), though, you will see that the majority of studies demonstrate beneficial effects on the subjects’ energy balance, i.e. the induction of an energy deficit – in many cases a very significant one. As Maher et al. point out, “[t]hese effects are achieved through separate mechanisms, and thus there is potential for the combination of MCT and exercise to yield increased satiety” (Maher 2018). The aim of the study at hand was thus to elucidate the effects of MCT, exercise, or a combination of the two on subjective appetite sensations, energy intake and overall energy balance to answer the previously rised question about the “fat burning machine”… OK, that’s not literally part of the outcome measures, but I guess you’ll get what I mean. a multi-item buffet lunch ad libitum to satiation, after which they completed diet diaries for the rest of the day. Expired air samples (for calculation of energy expenditure) and subjective ratings of appetite, on visual analogue scales (VAS), were taken every 30 min only for the initial 4 hours. The analyses of these data showed no effect of either lipid or exercise condition on energy intake at the ad libitum meal (Control-Rest 6278.4 Â± 1758.62 kJ; Control-Exercise 6785.2 Â± 1370.5 kJ; MCT-Rest 6077.1 Â± 1853.5 kJ; MCT-Exercise 6794.4 Â± 2030.3 kJ; P â¥ 0.05). There were also no differences for the appetite and satiety VAS scores (all P â¥ 0.05) and no effect on ratings of nausea (P â¥ 0.05). What Maher et al. did observe, however, were significant main effects for breakfast (P = 0.031) and exercise condition (P < 0.001) on total energy expenditure. With the subjects who had the MCT breakfast having a significantly greater energy expenditure compared to the control, and – quite obvious – the exercise trials leading to greater energy expenditure than the resting trials (Control-Rest 198.2 Â± 138.2 kJ; Control-Exercise 3045.8 Â± 606.2 kJ; MCT-Rest 211.1 Â± 186.6 kJ; MCT-Exercise 3272.4 Â± 763.2 kJ). If we also take into consideration that the +7.4% “gasoline effect” of MCTs amounts to an increase in energy expenditure of only 54kcal (let’s not even talk about the 3kcal increase in the sedentary condition), you will have to agree that it’s very unlikely that you’ll see weight loss wonders from simply upping your MCT intake – exercise to and fro. That’s not the least because a cumulative effect, as it could have existed, or an additional effect of MCTs and/or exercise on energy intake did not exist. Protein supplements are not necessary to get up to 45% of your energy from protein, but if you choose to eat chicken, cheese, meat, dairy & co, you should know these 8 Simple Rules to Minimize PROTOX! So what does this tell us? There’s no magic ‘nutritional bullet’ that will make the fat on your abs melt away … speaking of fat on your abs: This is one of the reasons I decided to discuss the two studies. They deal with normal-weight adults without metabolic derangement. People who may be unhappy with the aesthetics of their body. For them, and we know that from many previous studies, different metabolic rules apply compared to those for whom fat loss is essential for survival (eg.morbidly obese type II diabetics, etc.) – rules you could summarize as one rule of thumb: Eat more protein (up to 45% of your energy intake) and don’t trust the marketing claims of MCT producers, sellers, and social media celebrities that are pimpin’ them | Comment! Carr, K., et al. âHunger, Satiety and Energy Expenditure after High Protein Feeding.â Proceedings of the Nutrition Society, vol. 77, no. OCE4, 2018, p. E157., doi:10.1017/S0029665118001635. Clegg, Miriam E., Mana Golsorkhi, and C. Jeya Henry. “Combined medium-chain triglyceride and chilli feeding increases diet-induced thermogenesis in normal-weight humans.” European journal of nutrition 52.6 (2013): 1579-1585. Kinsella, R., T. Maher, and M. E. Clegg. “Coconut oil has less satiating properties than medium chain triglyceride oil.” Physiology & behavior 179 (2017): 422-426. Maher, T.J., et al. âThe Effect of Triglyceride Chain Length Combined with Exercise on Appetite, Satiety and Energy Balance.â Proceedings of the Nutrition Society, vol. 77, no. OCE4, 2018, p. E156., doi:10.1017/S0029665118001623. Ogawa, Akiko, et al. “Dietary medium-and long-chain triacylglycerols accelerate diet-induced thermogenesis in humans.” Journal of Oleo Science 56.6 (2007): 283-287. Rolls, Barbara J., et al. “Food intake in dieters and nondieters after a liquid meal containing medium-chain triglycerides.” The American journal of clinical nutrition 48.1 (1988): 66-71. Schubert, Matthew M., et al. “Acute exercise and subsequent energy intake. A meta-analysis.” Appetite 63 (2013): 92-104. Van Wymelbeke, Virginie, et al. “Influence of medium-chain and long-chain triacylglycerols on the control of food intake in men.” The American journal of clinical nutrition 68.2 (1998): 226-234.